These fights didn’t happen in a vacuum. 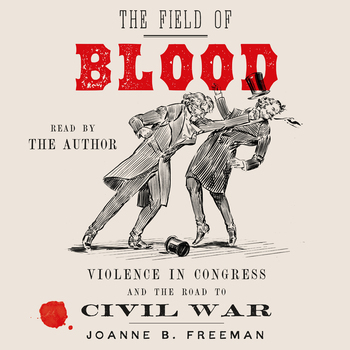 Freeman’s dramatic accounts of brawls and thrashings tell a larger story of how fisticuffs and journalism, and the powerful emotions they elicited, raised tensions between North and South and led toward war. In the process, she brings the antebellum Congress to life, revealing its rough realities—the feel, sense, and sound of it—as well as its nation-shaping import. Funny, tragic, and rivetingly told, The Field of Blood offers a front-row view of congressional mayhem and sheds new light on the careers of John Quincy Adams, Henry Clay, and other luminaries, as well as introducing a host of lesser-known but no less fascinating men. The result is a fresh understanding of the workings of American democracy and the bonds of Union on the eve of their greatest peril.